Huge spread on a 2,360 Square Foot home in Willo Historic District! Gorgeous red brick located in the highly sought after Willo Historic District. 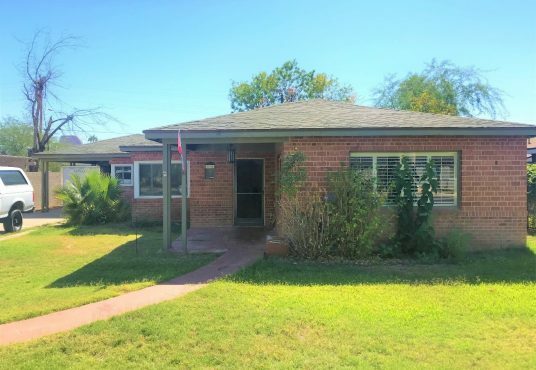 This 3 Bed, 2 Bath, 2,132 square foot main home was built in 1948 with a 230 square foot separate guest studio with a bath for a total of 2,362 square feet! This unique house has charm written all over it. There is an opportunity to add a huge master bed and bath to bring this property to its full potential all done under the existing roof! Based on the current market, the after repair value for this home starts at $600K and only goes up. New roof, plumbing, electrical and central air conditioning unit. Big ticket items are done, let’s make this house shine! As local investors with “boots on the ground,” we serve as the primary resource for our partners. This allows our partners to be as hands on or hands off as they prefer. In addition, we have assembled a complete team to assist from initial purchase to ultimate sale. This team shares our same high level of integrity and desire for top quality, setting us apart from any competition. As an additional level of due diligence, we utilize our team to assess each deal. This not only helps us cover all bases, but also to minimize risk. Our aim is to make it as easy as possible for our partners! Our expert team gives us a competitive edge! Nick Leonard leads the team and is a licensed CPA in California with a decade of experience as a financial professional. Throughout his career, Nick has built strong banking relationships and has now taken his talents to the Phoenix real estate market. His experience includes single family wholesaling and flipping both in California and Arizona. Nick functions as the group’s project manager physically overseeing projects from beginning to end! Our group is committed to operating at the highest level of integrity and having transparent and honest working relationships with everyone involved. Our partnership is based on these values maintained through to our partners. As one of our partners, you have our personal guarantee from us that we will act as a fiduciary to serve the best interest of all parties involved from beginning to end. When you surround yourself with the best, you rise to their level.